SHOULD THE US GET INVOLVED IN THE GREAT WAR? War broke out in Europe in 1914, with the entire continent being affected by the “war to end all wars.” The United States did not get involved militarily until 1917, however. Did they need to join in the fray “over there”? In our next class, we will discuss American involvement in the war. To prepare, you should also complete “Should America Enter the Great War”?” using the handout from class and the Advice for Mr. Wilson website. Make sure you follow the directions carefully – you should come to class with advice for the President! Should the United States have been an imperial nation? Overall target – I can evaluate American imperialism from multiple perspectives. I can create an original and effective editorial cartoon using cartooning techniques. You’ve seen a to of them in the last few weeks, so now it’s your turn to create an editorial cartoon commenting on American imperialism. You will draw a SINGLE CARTOON either supporting or opposing some aspect of imperialism, either general or specific. Make sure you have an ISSUE as the subject of your cartoon. You can draw your cartoon about imperialism in general or a single specific event involving American imperialism. THink about the comments brought up in our debates! HINT – The easiest way to create a cartoon is to think of your comment (thesis) first, then apply one or two of the techniques. I can discuss the the positives and negatives of American imperialism at the turn of the century. I can successfully and effectively prepare for and participate in an academic discussion. How do you hit these targets (and learn a ton in the process)? You prepare, making sure you have details, statistics, quotes, multiple arguments. You participate, making sure you stay on task, support your statements, listen to others, use the back-channel properly and effectively. You have a positive impact on the discussion/debate, refraining from personal attacks, put downs, nit picking approaches, and buffoonery. You reflect on your participation and your learning during and after the discussion. 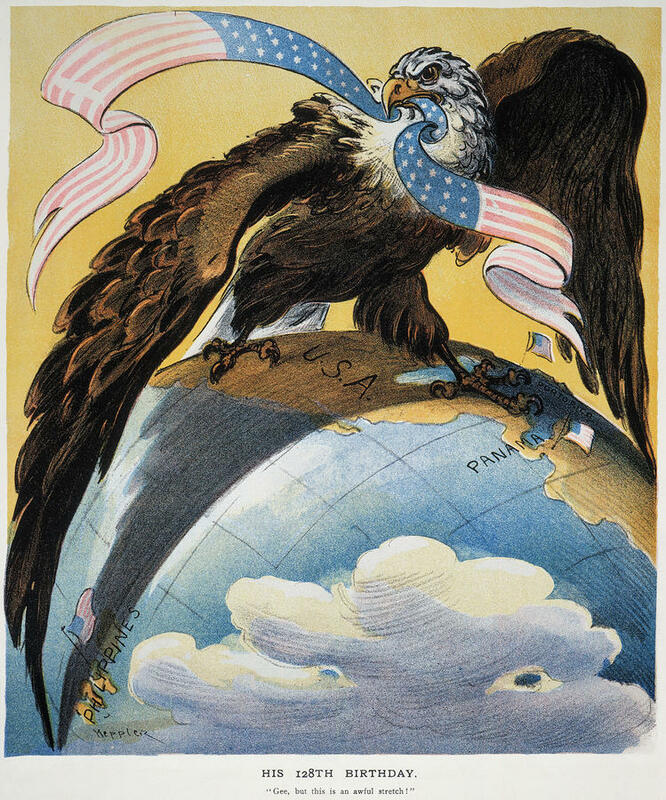 In our next class, we will examine American imperialism in more detail as we have a fun little discussion about the United States “spreading its wings” at the turn of the 20th century. The class will be divided into two groups, with one side defending the affirmative to the question and one side defending the negative. Each individual will be responsible for a general understanding of the Age of Imperialism through the preview video. In addition, each individual will become an expert on one area or example of American imperialism. You will be responsible for developing a DEBATE PREPARATION SHEET in which you create a statement of facts, identify what aspects and details of your argument you will use in the debate, identify possible ways in which the opposing side will challenge you and how you will respond, and identify specific questions that you will ask the opposing side to strengthen your argument. Your DEBATE PREPARATION SHEET must be completed by the beginning of the debate – and you will be evaluated on your preparation, as well as your participation in the debate. PREVIEW for February 13/14 – Get ready for Imperialism! I can describe and evaluate the causes, events, and impact of American imperialism. While the US was pushing for reform at home, the country was also expanding abroad in the era of IMPERIALISM. Was American imperialism right or wrong? That’s our essential question! How will we answer it? To preview our discussion, you should spend 30 minutes (yup, it’s timed) watching America in the 20th Century: America Becomes a World Power (usmstudent, wildcats). As you watch, use this viewing guide to consider the reasons why the United States became an expansionist country in the late 1800s, and then consider each example of American imperialism – ESPECIALLY THE SPANISH AMERICAN WAR. Should the US have been an imperial nation? That’s your goal! Want more? Check out our friend John Green! Posted in Uncategorized	| Comments Off on PREVIEW for February 13/14 – Get ready for Imperialism! Posted in Uncategorized	| Comments Off on The Gilded Age – Then and Now! As you have seen from our investigation of the Gilded Age, there was great of progress in the American economy, industry, urbanization, and immigration during the late 1800s early 1900s. However, progress comes with a price. Politics were controlled by the wealthy, and political machines were challenging they ideals of democracy in many of the cities. The income gap between the wealthy and the rest of the nation was enormous. The environment was ignored for industrial growth, and pollution and destruction of resources became problematic. Cities were overcrowded, and tenement living was unhealthy at best, deadly at worst. People didn’t know what was going into their medicine or food. Monopolies were formed with large corporations controlling many of the major industries of the time, and workers’ worries were ignored or opposed by business and government. Women were second class citizens, lacing political, economic, and social equality. African Americans continued to face challenges in all parts of the country. Who will respond to these problems? WATCH America in the 20th Century – The Progressive Era. Use usmstudent, wildcats as your username and password. What should you be looking for? A general idea of what the Progressive Movement was, an understanding of some of the reforms Progressives pushed for, and some info on the Progressive Presidents (including the big guy – I mean the REALLY big guy). You can (and should) use the Progressive Era Intro as a guide – but no writing is necessary. You can also watch my buddy John and his Crash Course on the Progressives … but make sure you watch the above video first! Though a century has passed since the heyday of the great industrialists and financiers of the Gilded Age, the debate continues: were these men captains of industry, without whom this country could not have taken its place as a great industrial power, or were they robber barons, limiting healthy competition and robbing from the poor to benefit the rich? Where do we draw the line between unfair business practices and competition that leads to innovation, investment, and improvement in the standard of living for everyone? Would the industrial economy have succeeded without entrepreneurs willing to take competition to its extremes? It’s your chance to take a stand on this issue and state your case. Using the four sets of resources (SOURCES – PRIMARY / SECONDARY / TOONS / STATS ) your preparation task is to take some notes on both sides of the historical argument – were the great industrialists Captains of Industry or Robber Barons? Then, develop an opinion and a few convincing and detailed statements to add to an online discussion about this topic. Of course, you can make connections to the present here to add to your overall sketchnotes and links to today! The links below come from “The Men Who Built America”, a recent History Channel documentary. Check out more about your individual! In-class Creation – Sketching the Gilded Age! The Gilded Age was an era of America’s story often overlooked in history classes – but essential to understanding our world today. The incredible growth and change in the United States set the stage for modern America to emerge at the turn of the 19th century, and for a complete transformation of American society. What does that mean for us in 2019? Some feel we are in a second Gilded Age – more agree with that opinion – actually, even more! Wait – another one? And, is it everywhere? So … what does this mean for us? Why does this era matter? To begin our quick examination of the Gilded Age, your task is to visually represent many of the content and themes of the era by creating some sketchnotes or collage. Using the materials available here and the videos from your preview work, draw and BRIEFLY describe the various topics that the characterize the Gilded Age. Check out my example below! To help you limit your searching, try using this chapter from Holt’s United States History from Independence to 1914. There are other links that can help you below for specific topics. You do NOT have to read every word … instead get a decent overview of the various topics-ok? Paper platforms are available in class, but if you want to use your own paper, feel free! Posted in Uncategorized	| Comments Off on In-class Creation – Sketching the Gilded Age! Hey young historians! We are moving from the Wild West to the cities of the Northeast and we dive into the Gilded Age! To prepare for class on Monday/Tuesday, take a look at the materials below and be able to give a decent description of “THE GILDED AGE” as you enter class. Check out “The Gilded Age Overview” from Digital History. Check out “The Gilded Age” from USHistory.org.